Err, we watch a lot of TV! Well, that's not entirely true... we watch a lot of TV series retrospectively. In fact, we rarely watch TV - apart from when The Great British Bake Off, The X Factor (for me at least) or The Apprentice are on, we don't watch anything 'religiously'. And even those, its a case of if we're not doing anything, we'll watch. I admit, Casualty is my guilty pleasure, but I can go without! We do love a US TV series though, as you can tell from the above. Yes, we've watched them all, and every season, apart from Dexter which is a work in progress. We started off with 24 at Uni, and spent far too much time when we should have been in lectures following the adventures of Jack Bauer. More recently Homeland and Game of Thrones, and we're just as hooked. Rich has read all of the GoT books and isn't allowed to say anything when its on in case he gives anything away! And although I'm a massive pansy when it comes to blood and gore, I quickly got into The Walking Dead and Dexter. So my question is, what next? We need recommendations people! Note: we're not as sad as this suggests, and do have lives! 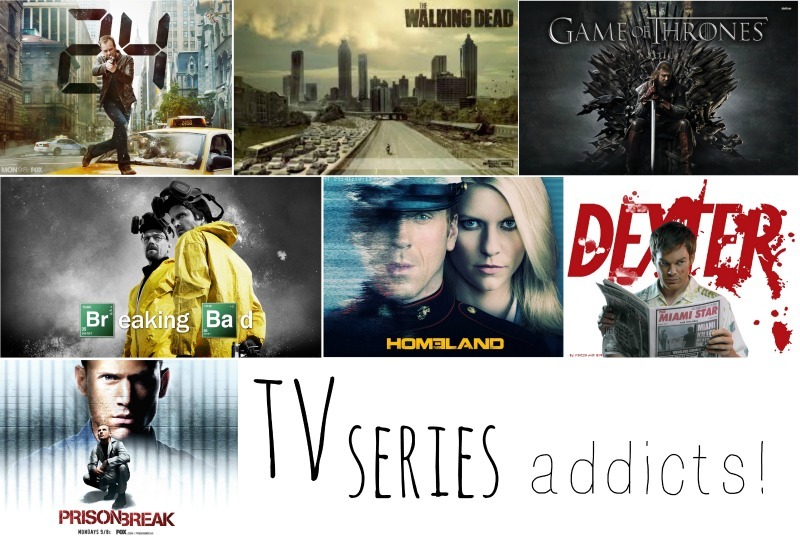 Great post - I watch far too many shows too! I'm just making my way through Breaking Bad at the moment and am planning to start 24 sometime soon as I've heard such great reviews. I LOVE game of thrones and modern family - I have heard so many people talking about breaking bad, it doesn't seem like my kind of program but I might have to watch the first episode! We are two episodes from the end of Dexter! It's such a great show. Love The walking dead too. We watch New girl, Modern Family, Big Bang theory, How I met your mother, Ncis. We must must watch Breaking Bad...heard so many good things about it! We barely watch normal tv and watch mostly American shows.